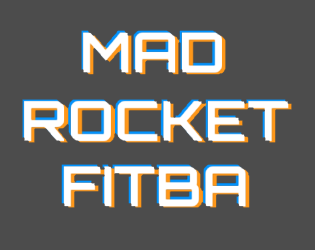 Multiplayer game where rockets play football with each other. I thought of the perfect name, but it was taken, so MAD ROCKET FITBA it is. Two to four players, you need at least one controller, although the keyboard controls aren't recommended, so ideally two to four controllers. WASD to move, arrow keys to shoot, 1234 to change weapons, if you are using the keyboard. It was made and tested with Xbox 360 controllers, I presume other controllers will be mapped okay. Quitting doesn't work and I can't figure out how to fix that. Alt-F4 is your friend. This was pretty much just a project for me to learn the Godot engine but I figured someone else might get a kick out of it.